Payments are essentially transportation tasks as funds are transferred from payer to payee following established payments flows that are characteristic of a given payment instrument. Generally the payee has provided some kind of service or goods to the payer, who will in return pay an agreed amount of money against a request for payment, usually an invoice document, as part of the invoicing process. Cash (bills and change): Cash is one of the most common ways to pay for purchases. Both paper money and coins are included under the larger category of "cash." While cash has the advantage of being immediate, it is not the most secure form of payment since, if it is lost or destroyed, it is essentially gone. There is no recourse to recoup those losses. Personal Cheque (US check): These are ordered through the buyer's account. They are essentially paper forms the buyer fills out and gives to the seller. The seller gives the cheque to their bank, the bank processes the transaction, and a few days later the money is deducted from the buyer's account. With the increasing trend toward fast payment, cheques are seen as slow and somewhat outdated. Debit Card: Paying with a debit card takes the money directly out of the buyer's account. It is almost like writing a personal cheque, but without the hassle of filling it out. Credit Card: Credit cards look like debit cards. But paying with a credit card temporarily defers the buyer's bill. At the end of each month, the buyer receives a credit card statement with an itemized list of all purchases. Therefore, rather than paying the seller directly, the buyer pays off its bill to the credit card company. If the entire balance of the bill is not paid, the company is authorized to charge interest on the buyer's remaining balance. Credit cards can be used for both online purchases and at physical retailers. In bank account-based systems the funds move from the payer's account to the payee's account within the books of financial institutions providing payment services. The need for physical transportation of cash has changed to transporting payment instructions for making the required bookings. 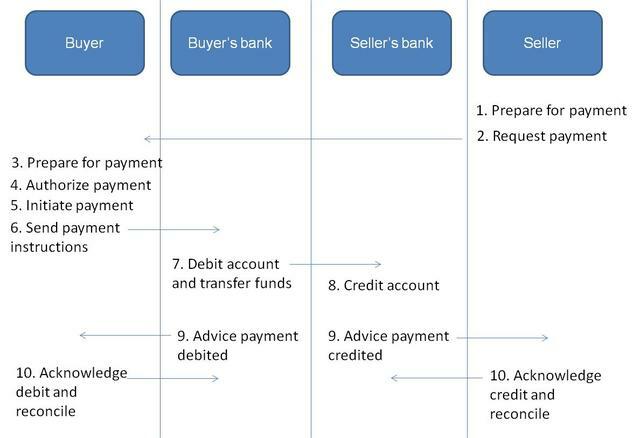 The diagram illustrates a typical sequence of payment operations. The possibility to make and receive payments "both domestically and internationally" through a variety of channels eases the task of trading partners by ensuring their goods or services are properly paid for and that issued payments are safely applied and routed to the right bank accounts. The increased variety of payment methods and channels has however produced challenges arising from the impact of greater regulatory change, forcing trading partners and their financial institutions to comply with rules and guidelines. These can sometimes slow down the process and require additional steps to "for example" check the identity of the counterparties, ensure payment instructions are correctly issued by authorized parties, or reduce the fees applied by banks for payments transactions. Competition from existing players and new entrants, as well as the impact of rapidly advancing internet and mobile technologies, are additional elements in the choice of the payment instrument and the channel to use. Companies are continuously seeking ways to reduce costs and improve efficiency: managing payments makes a difference. Cash-based payments are manual and prone to inefficiencies and fraud. Bank-account based instruments require electronic transfers of payments to reap all the benefits. With the development of information technology and the wide adoption of computers, networks, mobile telephones and other e-based solutions, methods for payment have moved to a new level of efficiency. In particular electronic applications offer possibilities to simplify and facilitate payment procedures. Initiation, transportation and bookings of payments can currently be made immediately to anywhere in the world. Payments can be finalized without any manual or paper-based routines. One major development trend that significantly impacts trade is the increased use of payment methods where the credit institutions become part of the payment chain. To postpone the payment due date, many more consumer payments are based on credit cards. Corporate customers use factoring. This has given banks a central role. For all payment instruments, the payment service providers must be connected to each other in order to facilitate the transportation of funds between the different institutions. The instruments should be harmonized and thus use inter-operable procedures. Useful reading includes "International regulation and treatment of trade finance: What are the issues?" WTO 2012.